The Newark City subway passes beneath the Central Avenue Bridge in the City of Newark, New Jersey. The Central Avenue Bridge is experiencing a number of simultaneous and pressing safety concerns due to degraded and obsolete infrastructure. The Central Avenue Bridge spans across the subway which serves as a major transit connection to Newark’s Central Business District, University Heights and the regional transportation hubs of Newark Penn station and Broad Street Station. 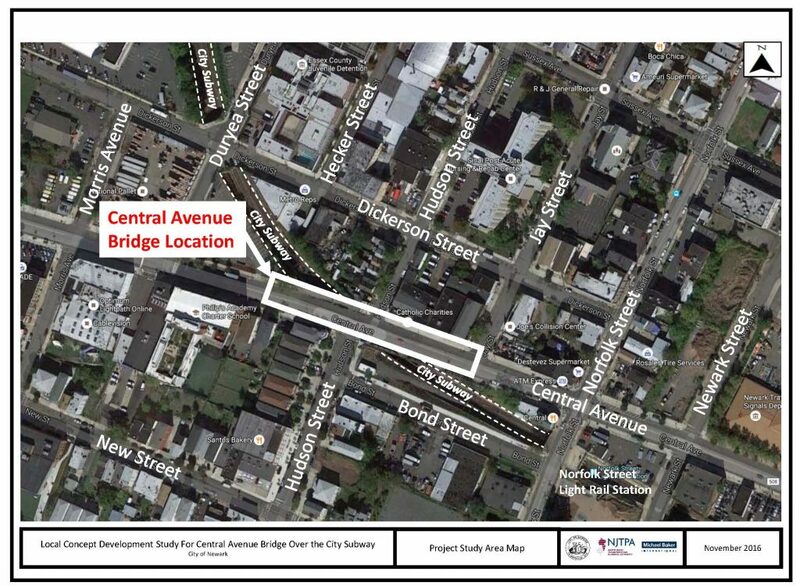 Similarly, the roadway portion of Central Avenue is a primary arterial serving as a major east-west route connecting commuters and city residents with Interstate 280, NJIT, Rutgers University and Newark’s Central Business District. As the bridge serves many varied interests, the LCD Study process is designed to enable full public participation. Future plans for the Central Avenue Bridge will be presented to the public so that the community’s voices are heard. During the LCD Study, the Project Team will coordinate with representatives from the NJDOT, Federal Highway Administration, Essex County, City of Newark and other stakeholders. Public Outreach: The Project Team will prepare a Public Outreach Plan (POP) to outline the public participation process during the Study. Public Outreach, an important component of a LCD study, helps guide the planning process by facilitating public input. Existing Conditions: The Project Team will gather data from the Central Avenue Bridge area including traffic conditions, crash data, local demographics, and environmental information to inform the LCD Study, in order to inform future recommendations. The Team will develop a conceptual plan for the PPA as part of the final Concept Development Report. Once a Preliminary Preferred Alternative is recommended with resolution of support by the municipalities and the County, and with concurrence from the Inter-Agency Review Committee (IRC), the project would move to the Preliminary Engineering phase. More information on the LCD process is available here.